Best selling author, speaker, business coach Dave Crenshaw joins Matt Halloran today to discuss what he knows best - accountability and time management. Dave is a particular expert in his field as his personal background isn't that he's a classic type A person. On the contrary, Dave has been diagnosed with ADHD, making him inherently disorganized. Unlike many others we often hear from explaining to us how to stay focused, Dave has overcome his natural instinct for chaos and can now behave as though he has inherently organized, a skill set he has now taught hundreds to thousands of people. Having designed a system that was built for the most disorganized person in the world, Dave understands how to take anyone, regardless of their starting point, to a level of successful organization. Together with Matt, Dave is going to explore how you can become the master of your own time by understanding a few of the simple lies we often tell ourselves that keep us from optimal efficiency. If you're ready to take 2019 by storm, listen in today and find out how to become master of your own time and success. Joining Matt today is professional speaker, keynote speaker, mindset strategiest and a business coach Debbier Peterson. Debbie is an expert in helping people get out of their own way to excellerate their results. When it comes to our own success, we all need to get out of our own way, as we are often the number one thing inhibiting and prohibiting our own success. Debbie and Matt walk through one of her programs, From Frustrated to Focused - Mindset Strategies for Business Growth to help decipher some of the best ways you can step out of the way and let success happen. Debbie professionally motivates, educates, and inspires professionals to discover what is holding them back. If you're ready to tap into your own success, be sure to listen in today! Episode 88 - Should You Be a Thought Leader? How often do you encounter the word "thought leader" in your daily consumption of content? As you might have guessed, it is a truism that thought leaders tend to be the most successful individuals or firms in their respective fields. However, thought leadership can be so much more than that. Today, Kirk and Matt discuss whether you have what it takes to become a thought leader. At Top Advisor Marketing, being a thought leader goes beyond the basic definition. It's not a pedigree. It's not about where you went to school. Thought leadership is about providing the best and deepest answers to your clients' biggest questions in the format they prefer. If you're ready to task yourself with becoming a thought leader, listen in and find out how you can use what you know, and who you know, to take your expertise to the next level. RESOURCES: Russ Alan Prince and Bruce Rogers - ContributorBlog Post: What is a Thought Leader? Michael Brenner Article: What Is Thought Leadership? And When You Should Use It? Episode 72 - Willa Silver - Good Referrals, Good Sales! Today, Matt Halloran is joined by Willa Silver, a talented sales professional with over 35 years of experience specializing in advisor practices. Willa recently became the owner of “New Language of Sales”, which is a coaching service that helps new time salesman find their feet in the industry. Together, Willa and Matt discuss the importance of referrals and good marketing. Getting referrals starts with your attitude, your approach, and your consistency to practice. For some, it is hard to ask someone else for referrals in fear of feeling incompetent. But no fear, Willa is here to direct you in the right direction and show you how you can become a strong connector and influencer in your practice. Tune in to find out how you can gather more referrals, and be a connector within your community! Kirk and Matt are joined by Paul Kingsman. Paul wrote the book, "The Distraction Proof Advisors". 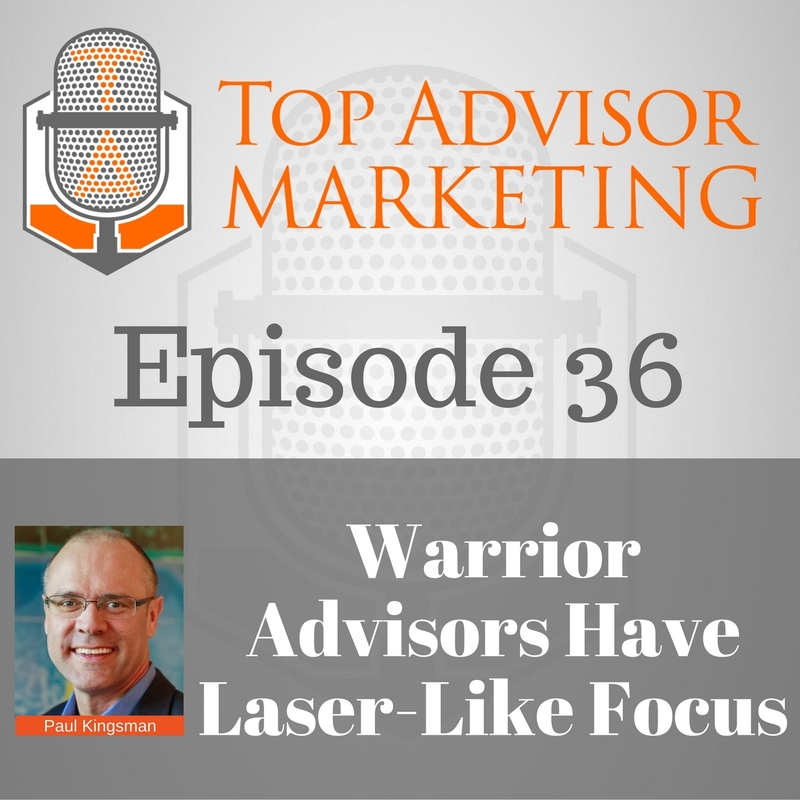 He speaks to, writes and coaches top advisors on how to pursue and achieve a laser-like focus. Paul shares four common ways advisors get distracted and how that distracts them from generating more revenue, more profit, more client time, more personal time and more fun in their practices. Paul also shares his experience competing in the 1988 Olympics and how it shaped his coaching business.